This article contains fast, interesting, fun facts about Nun for research, schools, students and kids providing an insight into the lives and religious beliefs of the ancient Egyptians. He was the personification of the primeval waters, from which the creator god emerged. He was also called Nu which means "abyss". He was called the "Father of the Gods" and is the oldest of all the ancient Egyptian gods but in terms of importance he was superseded by Atum-Ra the creator god. He played a part in the creation myth but was not worshipped as other gods, having no temples or priests and neither did he play a part in religious ceremonies or rituals. The above picture depicts a scene from the creation myth as detailed in the Book of Gates. The god is rising out of the primeval water (also called Nun) from which he raises the creator god, depicted as a scarab, in the Barque of Ra. 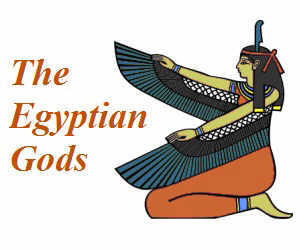 The creator god is accompanied by a number of other ancient Egyptian gods. The primeval waters represents the mysteries of the cosmos and chaos. The ancient Egyptian Creation myth of the the Heliopolitian cosmogony stated that first there was darkness and a primeval ocean. A lotus flower emerged from the mud deposit of the primeval waters and the Sacred Mound surfaced. The creator god was born from the lotus flower. In this creation myth Heliopolis was believed to be the point of creation and the birthplace of the gods. Another Egyptian creation myth referred to aquatic gods represented by frogs paired with goddesses represented by snakes. Snakes and frogs were believed to inhabit the primeval waters of chaos. The names of these aquatic deities were Amun and Amaunet, Heh and Hehet, Kek and Keket, and Nun and Naunet. 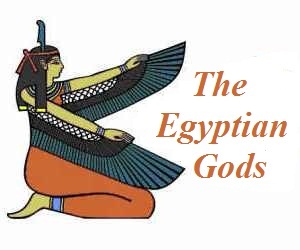 These gods were known collectively as the Ogdoad of Hermopolis. In this representation Nu was represented as a frog-headed god. In the Hermopolis creation myth it was believed that the primeval waters would eventually inundate the whole world, and once again the universe would revert to primordial chaos. Nu is therefore often associated with the forces of chaos. The ancient Egyptians believed that Nu existed in every particle of water and formed the source of the river Nile and its yearly inundation. Nu is therefore also considered to be a fertility god. In this representation Nu is portrayed in a similar fashion to the Nile god Hapi. Some of the Egyptian temples had a sacred Lake within the temple complex that provided water for the purification of priests and symbolically represented Nu, the primordial-ocean and renewal as the sun rose over it each day. Facts and information about Nun for kids with some amazing, cool and quick information about ancient Egypt and Egyptians. These fast interesting facts about Nun are ideal for children, homework, schools, teachers and kids of all ages.